By the afternoon, everything has changed: no longer bought or rented from a store, but built artisanally by Dodô’s talented hands, the caretas, or grimaces, parade through the town. Walking into the workshop is like penetrating a mystery, violating a secret. 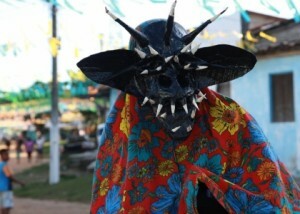 The caretas of Acupe (in the state of Bahia) have their own voice, costumes that transform people into incredible creatures, often times horrifying the children. Over the skirt – made from banana leaf straw like the Nego Fugido hunters – the colorful fabric shapes the body of what will become another being, a black, red and white creature, each color representing a part of the human being: red for blood, white for teeth, black for the African skin. Still at the workshop, the “rrrrrr” sound of sewing spreads through the space like a strange birdsong, bringing the creatures to life. 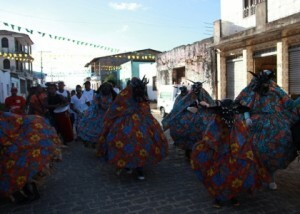 The block parades through town accompanied by the samba of the caretas, which prance around playfully. Some of them, keeping in their original tradition, distance themselves from the block and wander alone, chasing one, running after another, just as the rubber caretas make sure to remember. Watch more of the cardboard caretas parade here.